November 25, 2014 at 12:06a.m. Youngstown State football coach Eric Wolford watches third-quarter action during the Penguins’ game against Duquesne at Stambaugh Stadium. On Monday, the university fired Wolford after five years as the Penguins head coach. When Eric Wolford swaggered into Youngstown in 2010, fresh off a stint as Steve Spurrier’s offensive line coach in the big, bad Southeastern Conference, he looked and sounded like a man ready to be a head coach. In hindsight, Andrew Radakovich isn’t sure he was. Wolford failed to live up to those expectations, going 31-26 in five seasons before getting fired on Monday. 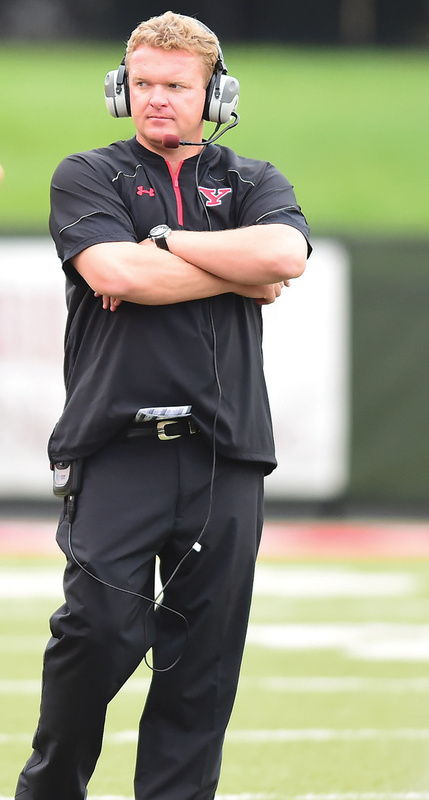 His tenure was marked by roster turnover (less than 25 percent of Heacock’s players remained on the roster at the start of Wolford’s second season), high-profile wins (including YSU’s first over a BCS school when the Penguins upset Pitt in 2012) and head-scratching losses, particularly in November. Senior safety Donald D’Alesio, a Cardinal Mooney High graduate who was part of Wolford’s first recruiting class, called Wolford “one of the hardest-working guys I’ve ever met” and said he doesn’t get enough credit for his positive contributions to the program. Wolford got the job in part because he was the polar opposite of Heacock, a brash, quotable extrovert who had an offensive background (which Heacock didn’t), loved recruiting (which Heacock didn’t) and loved the spotlight (which Heacock didn’t). While YSU’s leadership agreed the team needed a talent upgrade following Heacock’s final seasons, Wolford’s pull-no-punches approach rubbed many players the wrong way, particularly in the first few months when the new coach made it clear, privately and publicly, that he didn’t think much of the previous coach’s program or his players. “The one thing that Heacock did really well was, everyone bought in,” Radakovich said. “Everyone loved him as a coach. Wolford was a much more polarizing figure. You either loved him or you hated him. Wolford, who did not respond to an interview request, was also prone to over-hyping his incoming recruits to the point where it became a running joke in the locker room, Radakovich said. Shaw, who went through four position changes in his first two seasons before developing into an all-conference tight end, said the coaching staff also played favorites, which hurt team chemistry. “We knew it as players and it would rip through the locker room,” he said. “I’m not afraid to admit that. They were bringing in different guys that maybe necessarily shouldn’t have played right away, so there was never that true team camaraderie. Both Shaw and Radakovich said Wolford is an extremely talented offensive line coach but felt he struggled to develop a complete team, particularly the defense and special teams. Shaw also felt the coaching staff struggled to make second half adjustments, often dominating the first half offensively before getting out-schemed in the second half. A Brookfield native and Ursuline High graduate, Wolford was a four-year starter at guard for Kansas State who spent 15 years working his way up the coaching ranks. He spent two seasons at Illinois, helping the Illini to a surprising Rose Bowl berth in 2007, before joining Spurrier at South Carolina in 2009. But Wolford also ignored Spurrier’s advice not to take the YSU job, believing he was ready to take the next step. Wolford went 3-8 in his first season with the Penguins, finishing with a seven-game losing streak that featured a dizzying array of last-second losses. Things improved in 2011, when the Penguins shook off a slow start to upset eventual national champion North Dakota State in Week 10. Entering the season finale, YSU needed only to beat the worst team in the Missouri Valley, Missouri State, to make the playoffs. Instead, the Penguins blew a 17-point halftime lead and lost 38-34. That loss was the first of many doozies for Wolford, whose teams developed a reputation for playing small in the biggest moments. One of Tressel’s favorite sayings is “November is for contenders,” but Wolford went just 6-10 in November, losing six of his last seven games. On the positive side, Wolford leaves a roster built to contend for a playoff berth next fall, with eight returning starters on each side of the ball. He also leaves with a reputation as a no-nonsense disciplinarian who was willing to give people a second chance (for example, former Ursuline cornerback Dale Peterman and former Kansas coach Mark Mangino) but who wouldn’t hesitate to boot players who broke team guidelines (such as linebacker Teven Williams and wide receiver Michael Wheary, who were both kicked off the team in 2014). According to several YSU sources, Wolford could have kept his job by defeating three-time defending national champion North Dakota State last weekend, but the 38-14 blowout loss made it clear to athletic director Ron Strollo and Tressel that it was time for a change. March 25, 2010 12:09 a.m.
November 22, 2012 12:10 a.m.
October 26, 2011 12:10 a.m.
August 5, 2012 12:10 a.m.
September 6, 2012 12:10 a.m.